SpaceX launched itself another space industry first on Thursday when it reused one of its rockets to launch a satellite into space. SpaceX has launched its first recycled rocket. The Falcon 9 rocket launched from the pad at Florida's Kennedy Space Center on Thursday evening. It was the first time SpaceX founder Elon Musk had tried to fly a salvaged booster. The first stage landed on an ocean platform almost a year ago after a launch for NASA. "This is a huge day. My mind's blown, frankly," Musk said. He called it an "incredible milestone in the history of space" and predicted, "this is going to be a huge revolution in spaceflight." SpaceX refurbished and tested the booster, which still has its original engines. The booster also made a successful landing on a sea platform, which means it could be used for a third delivery mission. 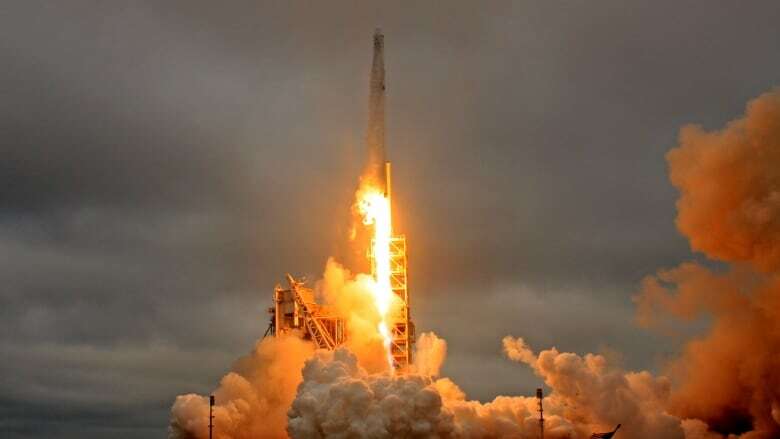 Musk's SpaceX, formally known as Space Exploration Technologies Corp., made history in December 2015 when it landed an orbital rocket for the first time and has repeated the feat seven times. By reusing rockets, SpaceX aims to cut its costs by about 30 per cent, the company has said. It lists the cost of a Falcon 9 ride at $62 million US but has not yet announced a price for flying on a used rocket. SES received a discount for joining the inaugural run, chief technical officer Martin Halliwell told reporters this week, declining to specify the cost. Price alone was not the reason SES, with a fleet of 65 satellites, decided to fly on a used rocket, he said. "Someone has to go first," Halliwell said. "Really what we want to do here is encourage the launcher industry to follow this way forward." Proving the concept works is crucial to SpaceX, which is moving on from an accident in September that damaged another Florida site. SpaceX also is working on a passenger spaceship, with two unidentified tourists signed up for a future trip around the moon. The company's long-term goal under founder Musk is to fly people to and from Mars. For its 33rd mission, SpaceX is reusing a Falcon 9 booster that originally flew in April 2016. "We don't believe we're taking an inordinate risk here," said Halliwell, noting that the rocket is in sufficiently good shape that its launch insurance rates did not increase. He declined to give the cost of the SES-10 satellite. After sending the SES-10 satellite on its way to orbit, the rocket's first-stage will turn around and attempt to land itself on an ocean platform. If successful, SpaceX could fly the booster a third time, said company spokesman John Taylor. The rocket's second-stage, which is not recovered, will continue firing to carry SES-10 into an initial egg-shaped orbit high above Earth. It will provide TV and other communications services to Latin America.